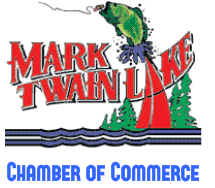 The Mark Twain Lake Chamber of Commerce is looking forward to your visit! Welcome to mark twain lake! Nestled between the bluffs of the Salt River Valley in Northeast Missouri, is the beautiful waters and breathtaking lands of Mark Twain Lake. The Mark Twain Lake and Clarence Cannon Dam project is managed by the U.S. Army Corps of Engineers. The 55,000 acre project opened in 1984. Mark Twain Lake is located 25 minutes southwest of Hannibal, the boyhood home of Mark Twain. Mark Twain Lake offers endless outdoor recreation opportunities. Thousands of people visit the lake each year to enjoy camping, fishing, hunting, boating, water skiing, trail riding and hiking. The lake has two marinas, numerous boat ramps and public beaches. At normal pool the lake encompasses 18,600 acres, providing a variety of fishing opportunities. Mark Twain Lake has 45,000 acres of land and water available for hunting. Clarence Cannon Dam contains a hydroelectric power plant capable of producing up to 58,000 kilowatts of power or enough power to supply a town of 20,000 people. The Clarence Cannon Dam contains 450,000 cubic yards of concrete and 3,000,000 cubic yards of earth embankment. The M.W. Boudreaux visitor’s center located near the Clarence Cannon Dam allows visitors to explore exhibits showing benefits of the Clarence Cannon Dam and Mark Twain Lake. The visitor center has numerous views of the lake, picnicking sites and a walking trail. On the west side of the lake is Mark Twain State Park. The park is home to the birthplace shrine of Mark Twain. The terrain is covered by bluffs overlooking the lake with stands of oak, hickory and maple that are filled with white-tailed deer, turkey and other wildlife. The park has a variety of amenities including a campground, picnicking sites, shelters, overlooks and hiking trails. The Mark Twain Lake Chamber of Commerce has 50 active members that help support the chambers mission of promoting Mark Twain Lake and supporting its members. Each year, the chamber promotes the lake through advertising, attending boat shows and helping with lake area events including the Halloween walk and Buddy Bass Tournament. The lake area has many businesses including a water park, winery, campgrounds, restaurants, hotels, resorts, antique shops, specialty shops, hardware stores, realtors, grocery stores and much more. The lake area is bordered by three charming towns, Monroe City, Paris and Perry. These communities have adapted to the lake and offer many services and specialty shops. We invite you to come spend a day or weekend with us at Mark Twain Lake. For more information view the vacation guide here or contact the Mark Twain Lake Chamber of Commerce at 573-565-2203 or the M.W. Boudreaux Visitors Center at 573-565-2112.